A lifestyle blog for single adults…but coupled adults are welcome too! I sat down with Nina Austin over coffee at Huckleberry’s in Florence on a cold, snowy Sunday morning and by the time I left, I felt like we had known each other for years and not just a few hours. As a dog owner and animal advocate I was excited to have the chance to meet and chat with Nina about her organic, wholesome dog treats (and my fur baby, Oliver, was eagerly waiting for my return in hopes that I would come bearing samples for him to try). I was not disappointed (and neither was he…but more of that later). Nina is originally from Omaha (her parents moved here from Arkansas before she was born), and has lived in the Minne Lusa neighborhood for 14 years. She and her partner wanted to live in a neighborhood where everyone knows their neighbors, families still go for walks around the block and everyone looks out for one another. They felt that they found all of that here. Shortly after moving into their house, they noticed an extra dog playing in the backyard and after chasing him around a bit, was able to catch him and bring him in. This poor pup had obviously been dumped and, based on his condition, they were pretty sure that he was a puppy mill reject – but to Nina and her partner, he was perfect. Oscar became a permanent member of their family. Sadly Oscar has crossed over the Rainbow Bridge, but he is still a vital part of Love Yo’ Pups and is the mascot featured by a caricature on all of their treat bags. I asked Nina where she got the idea to make homemade dog treats and she explained that after baking for humans for years, she was a little burned out. After pet food and pet treat companies began issuing recalls on their products a few years ago, she decided that it was time to do something about it and with encouragement from her friend Nick set about creating the perfect, healthy dog treat. From here, I am going to take the liberty of quoting their mission statement because it really says it best. “At Love Yo’ Pup, we feel that we are all stewards of the earth. That responsibility extends into every aspect of our lives, from utilizing renewable resources to supporting our community through locally sourced ingredients.” Nina believes that a healthy lifestyle should extend to every member of the family, including the four-legged, furry ones and therefore Love Yo’ Pup treats are made with only the finest, healthiest ingredients including free range buffalo, locally harvested venison and organic chicken. They also use organic oats for healthy digestion, spinach that is rich in vitamins and iron, and flax meal for shiny, beautiful coats. Love Yo’ Pup even has its own in-house quality control and flavor experts – Vlad and Ruby, two adorable little Chihuahuas who make sure that every batch is perfectly seasoned! Nina’s compassion for animals runs deep, and she credits her father for passing on his love of animals, especially the strays. She wants to spread her love of all pets as far as she can and is starting to network with other pet rescues in the area. In fact, a portion of the proceeds from every sale goes to Wags to Riches and Midwest Dog Rescue to help homeless pets find their forever homes! 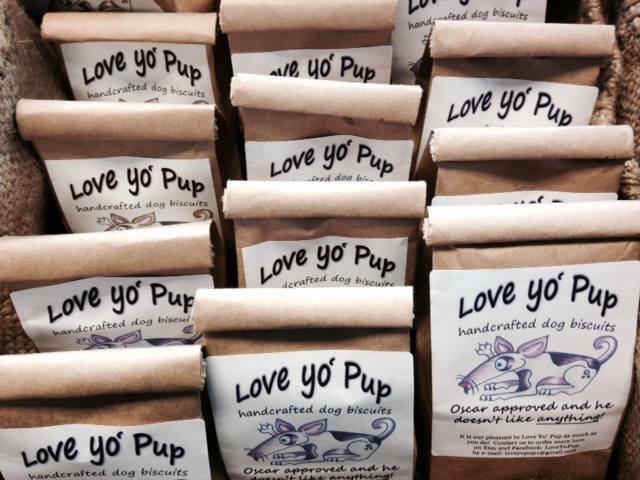 Love Yo’ Pup treats can be purchased at Wag Pet Store located at 2450 Harney Street- just east of downtown and the Old Market- or on Etsy at LoveYoPup. Oh…and those treats Oliver was anxiously awaiting? Thank you Nina for the bag of “Chicken Box Dinner” treats. He goes crazy every time I pull out the bag to give him one (or two). He’s already made a wish list for other flavors he wants to try! Jennifer Glomb on Welcome to 2015!